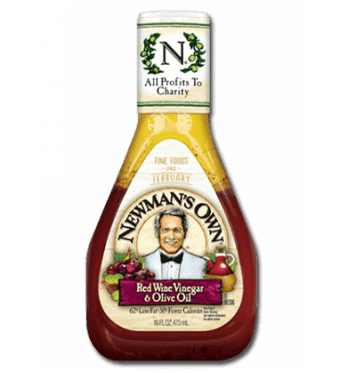 Some of the best low carb salad dressings come from a bottle. More often than not we make our own simple vinaigrette to go on our various salads but there are nights, when short on time, a decent bottled dressing does the trick. If you are looking for the best low carb salad dressings and the perfect avocado you do not have to go far. Most on the market are loaded with sugars and other questionable ingredients but then there are some really good ones if you know what to look for. 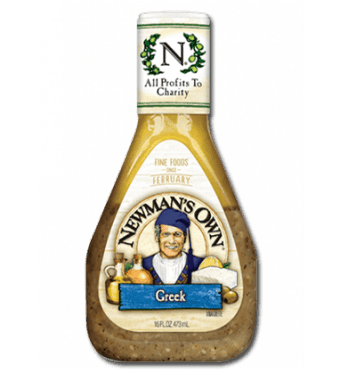 Newman’s Own offers several low carb, 2-3 grams per serving, options that are great in a pinch. They even have a low carb Caesar dressing but if I am going to make a Caesar Salad, I’m going to make it from scratch. One of my favorite quick lunches I learned from my mother. Believe it or not between the Rice Krispies and Pop Tarts there are a few healthy food habits that your / my parents passed down, whether they knew it or not at the time. 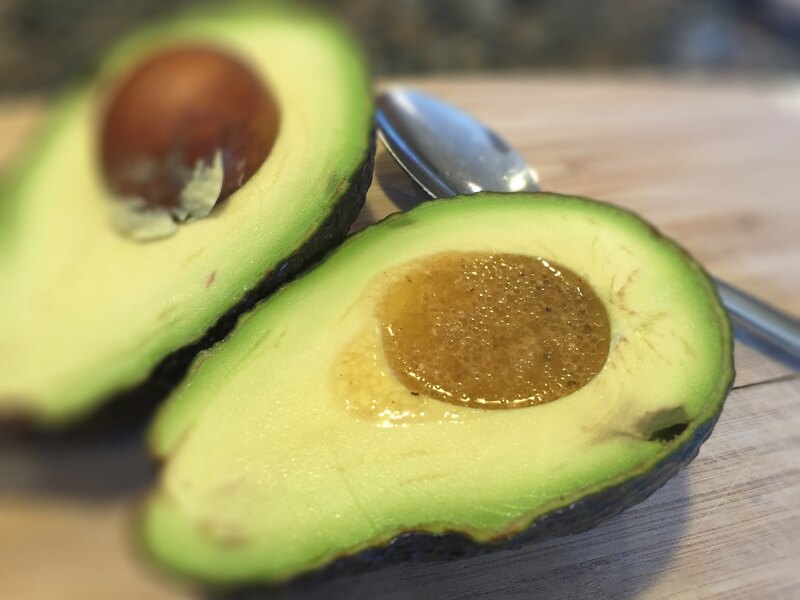 Take a perfectly ripe avocado, remove the pit and fill the cavity with a good italian-ish dressing – dig in with a spoon getting some dressing with each bite. So simple and yet this is how I learned to eat an avocado. Who knew all these years later that avocado would play such an important role in my weight loss as it represents the perfect keto-friendly food. Thanks Mom! I still have not adopted her avocado-pit-on-the-window-sill-tree thing but hey, there’s still time! If somehow you are new to avocados, here is the secret to a perfect ripe one. When you get one home, if its it is still hard and green, leave it on the counter for a day or two until it darkens a bit and feels a little soft but still firm when pressed on. Then put it in the fridge which will slow down the ripening process keeping it perfect until you are ready to eat it. Another way is checking under the stem. This part of the avocado holds a sneak peak for what’s going on under the skin. Peel back the small stem or cap at the top of the avocado. If it comes away easily and you find light green / yellow underneath, you’ve got a good avocado that’s ripe and ready to eat. Another great brand that has so many great low carb options, 0-3 grams per serving, is Annie’s. I try to stick with their organic variety as they have both organic and non-organic of most of their offerings. Another favorite low carb option, if you can find it, is from Cindy’s Kitchen. These are some of the cleanest bottled dressings on the market and will be found refrigerated among the veggie isles as they are the freshest on this list. Many of these have zero carbs so enjoy them often. You can’t go wrong with these easy week night shortcut dressings. Then again there is always the simplest solution – A really good EV olive oil and a squeeze of lemon on some arugula, salt and pepper, avocado, toasted pine nuts, shave some fresh fennel and parmesan and in minutes your perfect keto side salad is table ready. I found a great version in Unionville CT, made table-side by a native New Orleans Restauranteur transplant named Matthew at his upscale restaurant of the same name. His version was slightly different but amazing all the same. I always enjoyed our conversations as I watched his moves carefully in order to improve my skills. By chance, Lisa and I were there for dinner the night after Matthew passed away suddenly. He will be missed by many who enjoyed his stories and his creole inspired cuisine. As an homage to the former owner, his 2 large Wooden Caesar Salad bowls still adorn the new space refreshed by Cure which has recently opened in its place. 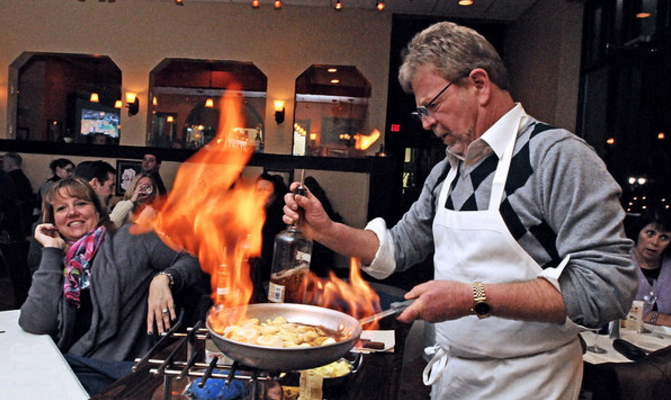 Matthew dazzling with Bananas Foster. So my recipe below comes from years of study and has been adapted for a lower carb lifestyle and a quicker and creamier execution as we make this recipe weekly. If you’re lucky, you will have some extra dressing for a lunch Caesar salad the next day. I usually add some prosciutto di parma for my leftover lunch version. A Caesar Salad you'll remember and make often. In a mini-prep processor add the garlic, anchovies, ground pepper, and lemon juice. Add oregano, mustard powder, worcestershire sauce, and egg yolk. Drizzle olive oil and then avocado oil slowly as you blend until creamy. In a large bowl - tear lettuce, by hand only to large bite sized pieces. Discard green tops. Grate 1 cups of the Parmigiano cheese. Shave the other 1/2 cup - set aside. Toss the salad with dressing until well coated. Add the grated Parmigiano - toss well. Sprinkle the red wine vinegar and toss again. Add the shaved Parmigiano - toss well. Add the croutons - fried pork skins - break them each in 2. To make it a meal on its own add sliced grilled chicken, salmon, shrimp or steak. Extra dressing may be enough for a lunch salad the next day - so nutrition info per serving may be off (high) a bit. This is one of my favorite go-to appetizers once Tomato Season arrives. In general Tomatoes are higher in carbs than other veggies (I know.. it’s really a fruit) so I added Arugula to this Caprese dish so I can go lighter on the tomatoes. No matter how lower-carb I am trying eat, there is no way I’m not eating local tomatoes at the end of summer when they are at their best here in New England. Another version of this salad has very good store bought variety of small tomatoes on the vine from Backyard Farms. I roast them at 350 degrees for 10-15min. The results… freakin awesome! This is one of the best caprese-like salads you'll have all summer. Toss Arugula with Olive oil to lightly coat. Lightly season with fresh ground Salt and Pepper. Slice Tomato thick and place several slices on top of the Arugula. Slice cold Burrata ball in half and carefully place cut side down on the tomatoes. Chiffonade Basil and sprinkle on Tomatoes and Burrata. Drizzle Olive oil over Burrata and tomatoes. Serve with 2 forks and knives and enjoy! 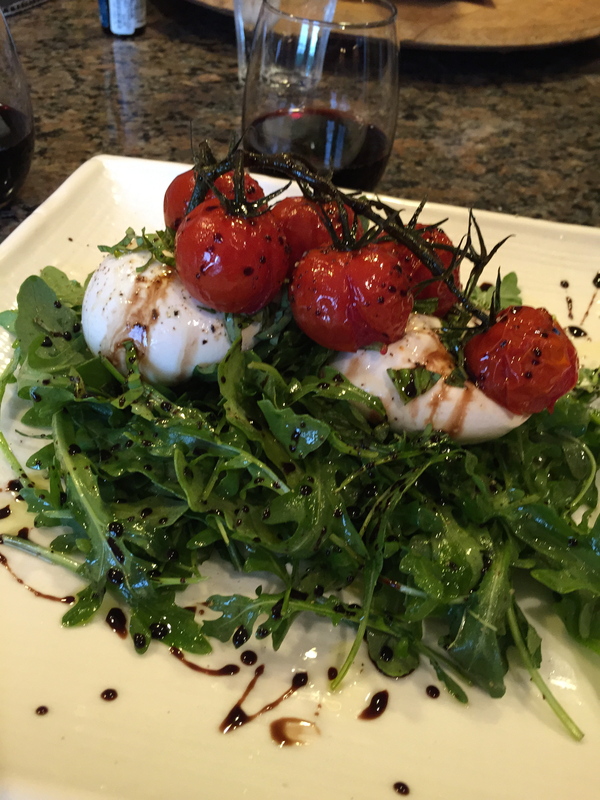 - Be sure to keep the the Burrata in the fridge until you are ready to make this as it is easier and less messy to cut in half when cold. - If you are not Keto-ing today, you can serve this app with some ciabatta toasts. 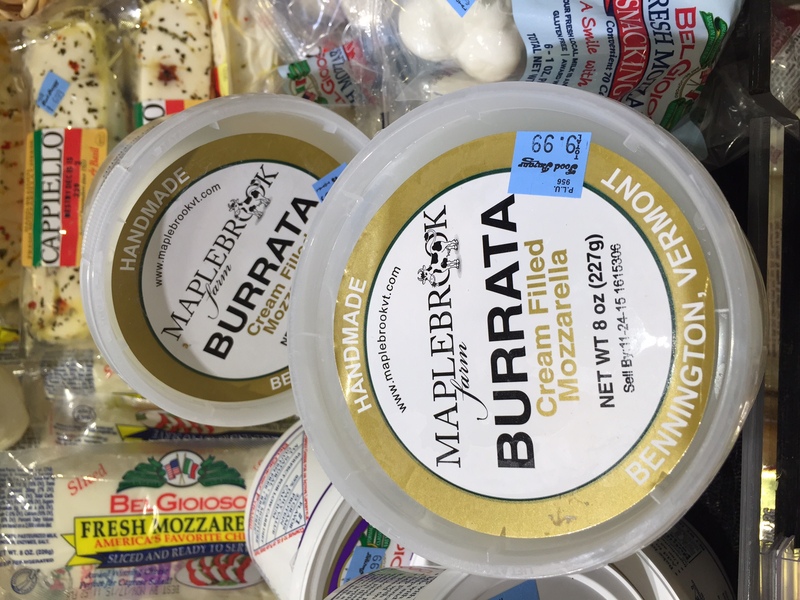 My favorite local brand of Burrata by far is from Mapplebrook Farms in Bennington Vermont. You can find it at Big Y and Stop n Shop and many specialty stores in the area.